It is beautiful, it look like very fine and elegant. 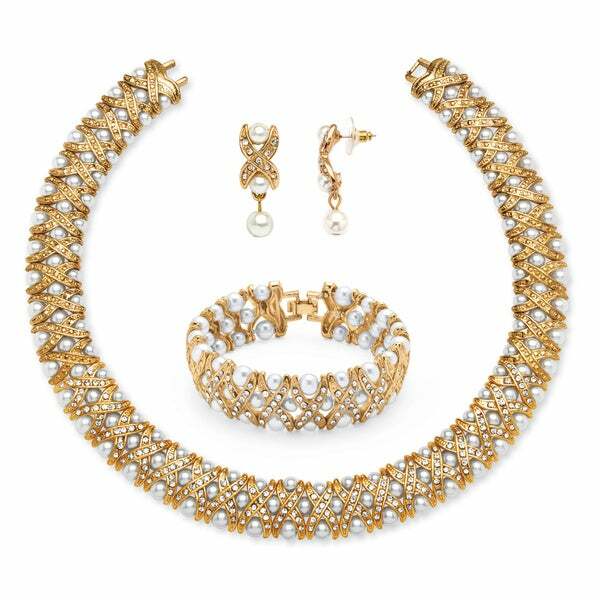 Layer up on luxury with this gorgeous 3-piece jewelry set. This set includes earrings, necklace, and bracelet each composed from a highly polished gold overlay and encrusted with opulent faux pearls and crystals. All weights and measurements are approximate and may vary slightly from the listed information. Treatment code CR (crystal beads). See Treatment Guide for further information. Much prettier in person. This set looks expensive and great quality. THIS PIECE OF JEWELRY VERY GOOD LOOKING. LOOKS MORE EXPENSIVE THAN IT WAS. VERY PLEASED WITH IT. WISH IT HAD ANOTHER EXTENSION MIGHT BE TOO TIGHT FOR SOMEONE WITH A LARGE NECK. MINE IS SMALL. LOVE IT. Absolutely beautiful set! It is very eye-catching and looks much more expensive than it is. The package arrived within 3 days, I'm very happy with this purchase. All I can say is WOW! This item came so quickly after I ordered it that I was shocked! The jewelry set is absolutely beautiful and I couldn't wait to put it on, the whole set just sparkles, and the clasps held wonderfully. The whole set is just beautiful and classy, not too flashy and not too heavy. With all of the pearls, and gold you would think that this would be a very heavy or overbearing piece, but it's not. Although the necklace is just a smidge too close to the neck as I would like, it sits very comfortably around my neck and is not snug. The earrings and the bracelet are not heavy, and sparkle brilliantly. The only thing that would make this set better, would be a ring to complete the set. That being said, for the great price that I paid for this spectacular piece of jewelry, not only am I Very pleased, but would recommend this item to anyone looking for a very eye catching jewelry set. Also the packaging for this item was exceptional. This item is well worth every dime spent. Very beautiful and striking set. Love how the pearls are imbedded into the necklace and bracelet. Bought it as a wedding gift for my daughter and she loves it!! This quality of this necklace bracelet and earrings set is acceptable, but the packaging is not. I need to get a jewelry gift box for better presentation as a gift, otherwise, it looks like kid's play jewelry. My wife lies the real thing. Pearls and gold and diamonds. But she had to admit that this is a nice set. I was surprised of this gorgeous set of jewelry. It is very fancy. This was ok I mean it looked good from a distance but when you looked at it closely it kinda looked a little cheap! Very beautiful! Love it! I bought to wear to a wedding and I am very amazed at the quality of this jewelry set. This jewelry set dressed up a simple black jumpsuit. I got lots of compliments. A gift for a friend. She love it. Great set for an elegant occassion. I purchased them as a gift. They looked beautiful in photo for costume jewelry/special occation, and I liked that there were pictures on a model for size, but the quality wasn't as beautiful in person, and I think I saw them less espensive somewhere else later so I was a little disappointed because I was on a budget. Absolutely love this set! Love the every piece. but it's bigger than the picture would have you believe.